It was book review entry week three weeks ago at NorthWind Menagerie. Nobody knew that but me; why am I confessing? Trying to select a book even tangentially related to the imaginary farm life, while I’ve been indulging in light fiction is a difficult hurdle. So, here is a review on a novel cook book, which firmly advocates raw milk and chicken liver, making it seem an appropriate choice to my winter twisted mind. This book was first published in 1999, and has a number of devoted followers, and has, in my opinion, strongly influenced the current alternative health food movement. Its exuberant, yellow, hippie art cover made me covet it every time I saw it listed in a catalogue, but I don’t buy cookbooks. I must protect my bookshelves from collapse. One day my mom gifted this book to me, my bookshelf just would have to suffer. My initial reaction to this book was actually one of disappointment. I’ve worked pretty hard at feeding my family healthy food, and it’s a little frustrating to be told in every chapter that “it’s not good enough.” It’s not enough to grind your wheat, you have to sprout it or soak it. Don’t even look at sugar. Eat liver to be a lengthy liver. Coffee, tea, and chocolate should be avoided. There’s always one more thing that has to be done to wholly earn your sanctification through good health. The main issue I have with this book is its underlying view of the happy savage, and its promise a possible health utopia. Forgive the political theory when we’re talking about a cookbook, but often the similarity between the far right and the left is that they both promise you utopia on earth, the difference is where they find it. The far left offers you utopia in the future, on these terrestrial shores, and the far right finds a utopia somewhere in the past that could be regained. This book is primarily based on the research of Weston Price, who finds his utopia in primitive cultures yet untouched by white man and its refined food, and in that good old hunter-gatherer ideal. 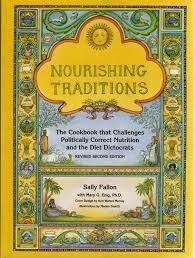 There are organ meat recipes in this book. Are you going to cook a recipe entitled Offal Burritos? Brains in wine sauce anyone? The world of lacto-fermenting opens up on page 89 and is the primary reason you will still find this book with brain recipes on my shelf. Food transformation is irresistible to me. Here’s the story of my conversion. Stay tuned and we’ll rot some things one day. What! You don’t want to come to dinner anymore? If you hate this book, I apologize. If you think I have been excessively critical on this book, I apologize. If you’re bored to tears, have a good cry, it’s okay. I understand that this stuff only appeals to a limited number of unique souls, most of whom would probably be monks in another age. I have long had a yen to be a monk, but my religion and gender preclude me from that pursuit. Being a nun would be far less of a hurdle, but nuns selflessly teach school and work tirelessly in leper colonies. Monks garden and keep bees and live with people who take vows of silence. Is that the just Hollywood version? I did see a cheese book, written by French Benedictine nuns, in a goat catalogue the other day. If they fire me here, you’ll know where to find me. Ora et labora, merci! As that about exhausts my Latin and French, I better hope that there is a vow of silence for cheese making nuns. There is only one thing in the world that would induce me to eat oatmeal porridge. Mom guilt. From age 15 to age 33 the foul, slimy concoction never crossed these fair lips. Three of my four daughters were unconcerned. They’re contrary, I just scream and howl about how they can’t make me eat something and they try to convince me of how good and healthy it is. Daughter number 4 just joined me in the resistance. Every good mom knows that her kids have to eat a certain amount of oatmeal or… or… something bad will happen. My lack of moral authority and will power to make her gag down cold oatmeal was not lost on her. Therefore, in the name of motherhood I made up a really tasty pot of oats with apples and cinnamon and prepared to happily choke down two tablespoons coated with plenty of brown sugar. It wasn’t too bad without the cold lumps and tears. Much to the amusement of my husband and children, I would eat it in a box, I would eat it with a fox… at least a nice lady like amount with a lot of sugar. Here’s my current favorite oatmeal recipe. Double and make ahead for quick week-day breakfasts, it re-heats in the microwave faster than you can make instant oats. 1 29 oz can sliced peaches, drained and chopped. Stir together the dry ingredients; add wet ingredients in order listed. Crumble topping ingredients together and sprinkle on top of oatmeal mixture after pouring into a greased 8×8 pan, bake at 350 degrees for 35-40 minutes. Do you like the idea of the simple life, but wonder what it should look like in the modern age? Join me on the journey of trying to figure out how to keep the barn, the kitchen, and home education all in balance. How to know when your goat is about to kid. In which I become a tattoo artist. How not to de-horn goats. northwindmenagerie · An odd and varied collection of animals, people, and ideas.